Please consider a tax deductible donation to MetEd to fund future upgrades to the system and to existing lessons. Your contribution of $10 will help us not only maintain the high quality instruction you expect from MetEd, but will allow us to incorporate new technology in the site. Why wait? Click on the donate button now at the top of this page. As you plan your end of the year charitable contributions, please consider a tax deductible donation to MetEd to fund future upgrades to the system and to existing lessons. Your contribution of $10 will help us not only maintain the high quality instruction you expect from MetEd, but will allow us to incorporate new technology in the site. Why wait? Click on the donate button now at the top of this page. The wildfire events affecting California have been devastating. Here’s some information about fire weather and the effects of wind and topography on fire behavior. 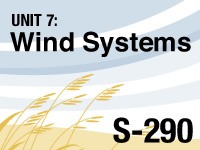 Available in both English and Spanish, all three of these lessons are appropriate for non-forecasters and provide some basic information about the wind patterns and other influences contributing to wildland fire conditions. On September 28, 2018 an earthquake-triggered tsunami impacted parts of Indonesia. The following lessons address the science of tsunamis. Tsunami Strike, Pacific Edition, is a scenario-based learning experience aimed at the middle school through high school level. On the front page of MetEd, we occasionally post a news article of interest to our user community. The News Archive is a collection of those articles. Want to know when we publish a new lesson or resource? Use the RSS link to subscribe to new lesson announcements using your news reader of choice or subscribe to our email list using the option on your account page.